What Day Of The Week Is September 17? 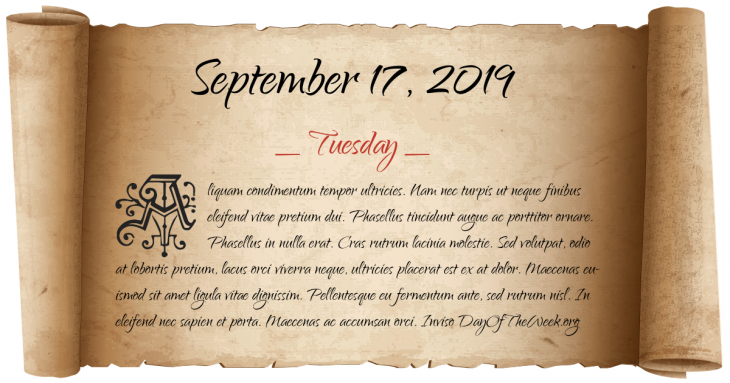 September 17, 2019 is the 260th day of the year 2019 in the Gregorian calendar. There are 105 days remaining until the end of the year. The day of the week is Tuesday. Highest Galician nobility led by Pedro Fróilaz de Traba and the bishop Diego Gelmírez crown Alfonso VII as “King of Galicia”. The Battle of Świecino (also known as the Battle of Żarnowiec) is fought during Thirteen Years’ War. The Presidio of San Francisco is founded in New Spain. World War II: Following the German defeat in the Battle of Britain, Hitler postpones Operation Sea Lion indefinitely. World War II: The Russian city of Bryansk is liberated from Nazis. The Lehi (also known as the Stern gang) assassinates Count Folke Bernadotte, who was appointed by the UN to mediate between the Arab nations and Israel. The world’s first retractable-dome stadium, the Civic Arena, opens in Pittsburgh. Who were born on September 17?